Dominique Strauss-Kahn's Story Plays Out On Stage Former IMF leader Dominique Strauss-Kahn, who was accused of sexual assault by a hotel maid, has all but vanished from the public sphere in France, but he remains a subject of fascination. A play imagining what could have transpired in that hotel suite in May 2011 has just opened in Paris. Former IMF leader Dominique Strauss-Kahn and Nafissatou Diallo, who accused him of sexual assult. 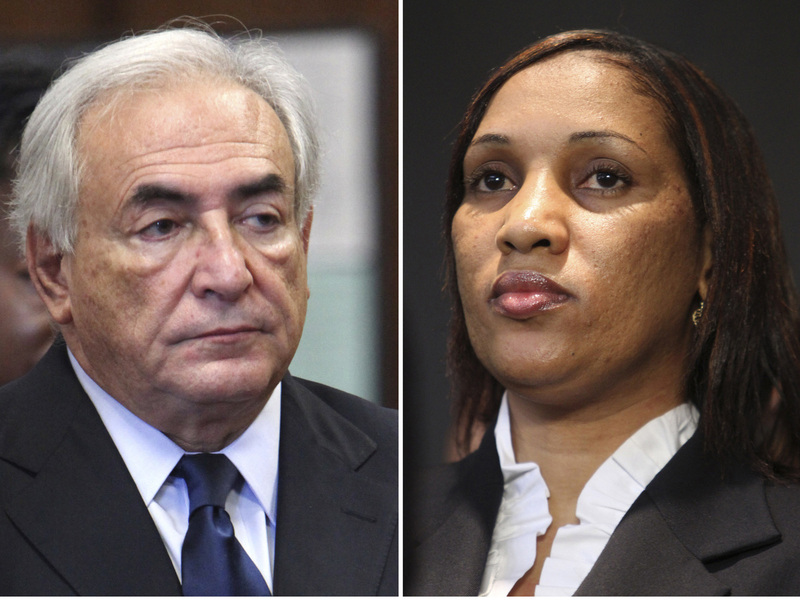 Lawyers for both sides will appear in court on Monday in Diallo's civil suit against Strauss-Kahn. Former International Monetary Fund leader Dominique Strauss-Kahn, who was accused by a hotel maid of sexually assaulting her in a New York hotel room, has all but vanished from the public sphere in France, but he remains a subject of fascination. A play imagining what could have transpired in that hotel suite in May 2011 has just opened in Paris. The play, called Suite 2806, evokes sexuality, race and privilege as the two actors spar and the power quotient constantly changes. Director Philippe Hersen says he received numerous scripts after Strauss-Kahn was arrested in New York. "But what I didn't want was some vaudeville comedy about what happened. This was intelligently written — a smart play about power, money and sexual addiction," says Hersen. Hersen calls Strauss-Kahn a modern-day Marquis de Sade who uses his power to seduce women. France was stunned by the scandal. Once poised for the French presidency, Strauss-Kahn saw his career and marriage end after the incident. On Monday, lawyers in the civil case brought by the maid against Strauss-Kahn will appear in court in New York. Jean-Louis Gauthier came to see the play with his wife, Lola. "We came to see the play, just to see how they write [rewrote] the story," Gauthier says. "We don't know what happened. It's a fiction, whatever happens, isn't it?" his wife adds. "I was actually quite relieved when he got caught because I think it started conversations in France that needed to be had." The hotel incident, though initially chalked up to American puritanism, became a watershed moment in France. Much like the Clarence Thomas-Anita Hill Supreme Court hearings in the U.S. 20 years ago, the DSK affair, as it was called in France, embroiled the country in a long overdue debate about sexual harassment, the misbehavior of powerful men and a media complicit with power. Actor Eric Debrosse says he worked hard to get the physical dimensions of Strauss-Kahn right in order to understand his sexual addiction. Debrosse gained 20 pounds for the role and perfected his sidelong glances. "Sometimes people say to me, 'Oh, you were too perverted,' or, 'You weren't perverted enough,' because everyone is imagining whatever they want," says Debrosse. Did Strauss-Kahn sabotage himself? Was he set up by former president Nicolas Sarkozy? Suite 2806 ends ambiguously. Gauthier says while no one will ever know what actually happened in that hotel room, it's a good thing it happened before Strauss-Kahn became the Socialist Party presidential candidate. Everyone knows Sarkozy had the goods on him, says Gauthier. "Actually, French people thank God he's been caught before the French election. She saves us because, actually, without this woman, DSK would be in the presidential election and we would have Sarkozy again for five years," Gauthier says. Next week, a French judge will decide whether Strauss-Kahn is to face charges of organized prostitution for his libertine soirees.